If we want to understand the records, we have to understand the law, and not just in the abstract, but at the very time and in the very place where the records were created. So… where do we find the law? That’s always a question, and it’s not always easy to answer. There are colonial laws that sometimes were and often weren’t collected and published and then digitized in an easily accessible form. Then in some cases there are territorial laws between the Revolution and statehood. And then the laws of the state. And sometimes you have to slog your way through both to answer a particular question. 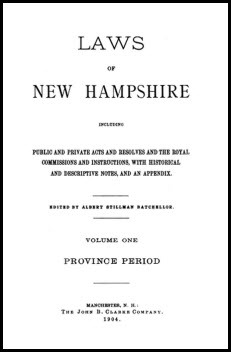 Even in a place as small, as orderly and as well-governed as the Granite State — New Hampshire — where I’ll be speaking on Saturday to the New Hampshire Society of Genealogists in Manchester — finding the laws can be tough sledding. A much-welcomed genealogy reference book would be such a list for each state and territory. Particularly a compilation of family-related law and sources for all those “special” individual legislative acts, or one relating to adoptions where the information is reasonably public, before the modern Sealed-Everything rules came in. I would try a nearby law library for legal databases, Google Books, archive.org and hathitrust.org. It would take many reference books to list all these records. Family Search and the commercial genealogy sites are not very helpful. The amount of records at the state and federal level is vast. Congress and all 50 states all have public laws, private laws, and rejected private laws. There are territorial records, state and federal court and appeals court records, military records, bounty land, pensions, state and federal land records, private land claims, approved and rejected homestead applications, letters to government agencies, as well as population and non-population censuses. Many books could be written on those records. We’re SO excited about your visit, Judy! Thanks for posting this! I only wish we had a similar list for the Spanish West Florida colony. Spanish civil law is very different from British law and the Mobile District has lost many records from that era. Is anybody else’s head spinning?